Katherine Kelly in the leafy greenhouse at KCCUA. Katherine chats with each customer at the spring transplant sale. From our perch on top of a stack of soggy hay bales, six-year-old Evangeline Ellingsworth and I can see the entirety of the farm that is her stomping ground. Beyond the curved hoophouses and still–barren fields, lie ranch style houses, a school, and the buzzing freeway. The farm is smack in the center of an urban environment. Six-year-old Evangeline Ellingsworth, daughter of KCCUA farm manager Alicia Ellingsworth, makes the farm her playground. Evangeline, daughter of farm manager Alicia Ellingsworth, explains to me the workings of the urban farm where she is growing up. From our high position, we can see the woman herself, framed in the doorway of the greenhouse. Katherine Kelly is the co-founder, executive director and soul of Kansas City Center for Urban Agriculture—a working farm and community center. She stands in her characteristic position, one leg up as she talks to folks milling around the spring transplant sale. With the farm’s responsibility on her shoulders, Katherine is busy. But she has time for a chat with everyone this busy Saturday afternoon– the farm crew, her customers, the refugee women she teaches to farm for a living. With Katherine’s hard work, development and apprenticeship programs strengthening local agricultural infrastructure sprung up around KCCUA. One project is the Juniper Gardens Training Farm, where local farmers helps refugee woman negotiate the challenges of starting an urban farm. From policymakers to religious leaders, Katherine speaks with everyone about the growing movement supporting local food, a movement she fully believes in. Katherine points a customer to fresh, home-grown greens at the spring transplant sale. KCCUA’s many programs mean that Katherine spends an equal amount of time in the office organizing as actually in the dirt. Sometimes it’s a hard balance. Katherine worries about her produce until the Saturday morning market. As she walked quickly through the greenhouse with me on a Friday afternoon, I complimented her on what looked to me like Eden: rows of leafy greens and blooming flowers. “Oh, I see a lot of problems out there,” she said with a wry smile. Only the next morning in the pre-dawn chill, as the farm crew packed the vegetables for market, did she finally relax. Katherine listens to the questions of a fellow farmer. “I think things are going to be all right,” she said. Katherine’s customers know the care she takes with her produce. KCCUA’s fresh-tasting tomatoes have the farm’s own guarantee, a guarantee customers value after recent salmonella outbreaks in food produced by large corporations. Even organic labels do not have that personal guarantee: according to a New York Times article, large corporations produce 25% of organic foods. At the Saturday morning farmers market, Katherine meets customers who have raised their children on her produce. She supports people, she feeds them. It is one and the same. Plants grow and relationships grow together at this farm. Back in the greenhouse, a Hmong woman, Kim, solemnly waters her budding greens. Angela, a cheerful woman who runs a church youth garden, trims plants with two young girls. The girls are timidly friendly, telling me shyly that they love harvest time. Angela prepares the food that they’ve grown into such delicacies as red cabbage with apple. She is proud to be teaching these young girls about farming. Everyone is sharing stories, asking advice, and learning. At the heart is Katherine. She is the go-to person for everything. “She is my best farming friend,” says Angela. We constantly hear that youth are our future, but what will that future look like with the ever-increasing disconnect between our food and ourselves? A number of local, urban farmers are fighting that future, by providing youth an opportunity to relearn our food. During the summer you’ll find youth working the fields, rows, and greenhouse at J-14 Agricultural Enterprises, Troostwood Youth Garden, and Kurlbaum’s Heirloom Tomatoes. At all three establishments, the education does not just happen while digging the soil. Joe Jennings, at J-14, has a rainy day “classroom” where youth can learn widely about biology, ecology, and botany. At Troostwood, Ericka Wright’s workers receive stipends for school materials and some have continued the lessons learned in the garden while in college. The Kurlbaum’s have used their tomato profits to put one of their children through school and they have plans to start scholarship gardens, the profits from which would go towards college tuition. By working, whether as volunteers or as a summer job, both the youth and the community benefit from these operations. Studies show that youth reap many positive benefits from volunteering. The communities also reap benefits from urban farms. In providing fresh produce the farms provide health benefits and the local economy receives a boost when food dollars stay in the community. Farming no longer has to be about fields and barns. Right in middle of an urban district, on a plot of land next to a storefront or parking lot, an urban garden can sprout and bring a new source of food and sense of community. The saying in real-estate is location, location, location, but urban agriculture ignores such advice and finds a way to flourish. Deep in the suburbs, urban farmers have an opportunity to grow vegetable inside and transfer them to their yards when the seedlings are ready. Suburban homes are typically bigger and easier to climate control. Any room in the house, even the basement, can be turned into a grow area with some inexpensive grow lamps and tables. That’s how Liz and Sky Kurlbaum — of Kurlbaum’s Heirloom Tomatoes — operate their business. In their basement, right next to their washer and dryer, the Kurlbaums have traded in a table to fold their clothes on, for a make-shift greenhouse that supports thousands of seedlings. If suburban farmers are worried about the electric bill, it’s possible to start seeds in small, starter containers available at any garden store. Right outside the city is also an ideal location to start an urban farm. For starters, land tends to be less expensive and more acreage tends to be available, not to mention more manageable. On a small farm about 15 minutes from downtown Kansas City, Joe Jennings of J-14 Agricultural Enterprises grows a wide variety of veggies as well as some fruit using about 8 acres. Because of the space available, Joe is even able to occasionally raise select livestock to complement his produce such as pigs. Urban agriculture has previously had to fight to overcome the image that farming is something that has to be done in the country and brought into the city. Even a vacant lot, entirely surrounded by concrete can make the perfect urban farm. The Troostwood Youth Garden, located on Paseo Boulevard, fits this description precisely: It’s situated on a traffic-jammed street between houses and the occasional gas station. A major advantage (but disadvantage to the neighborhood) is that the Troostwood Youth Garden has very few produce competitors. Urban neighborhoods lacking grocery stores or farmers market sincerely reap the benefits of such a community center that promotes healthy eating. Neighboring Rockhurts university realised this and has supported the garden since its germination in 1999. I’m not going to lie: sometimes it’s hard to keep a little optimism when it comes environmentalism — really hard. Try watching Flow or Earthlings and then go try to enjoy yourself. It’s best to call it a night immediately, even if you caught the matinee performance. And like those documentaries as they approach the credits (or in Al Gore’s case are the credits), I see some hope for the future based on what I’ve learned about in KCCUA. Sometimes a spare tire is all we have or need. Urban agriculture mixes urban life with resourceful farming practices. We eat food on a daily basis but we don’t think about food daily. It’s only when we are unhappy with our image or startled after a close-call with our health that we talk about diets, and then, most of us are still talking about soda. But urban agriculture can reverse this trend. Urban agriculture can get us interested in growing things in our windowsills or in plots of undeveloped land cushioned between parking lots and storefronts. Even renters in small apartments can grow plants things from eggplants to cherry tomatoes from their bedroom balcony. Urban agriculture can help us if we are worried about our health or rising food prices. It can even lead to promising business and economic opportunities if we are worried about the lightness of our wallets. These days, it’s difficult to rely on the stock-market, so why not invest now in the soil in our own back yards? As environmentalists and journalists we have such a hard time getting people to read and consider the truth. No one wants to hear about real energy solutions only light-bulbs and other “feelgoods.” What if we stopped trying to introduce people to the movement via the TV and instead handed them a spade and a few Fourth of July tomato seeds? Growing up in Los Angeles my definition of a farm came from a field trip I took in first grade –we drove out of the city to visit cows and see corn grow. This interaction led me to believe that food isn’t grown in the city and except for the occasional garden. 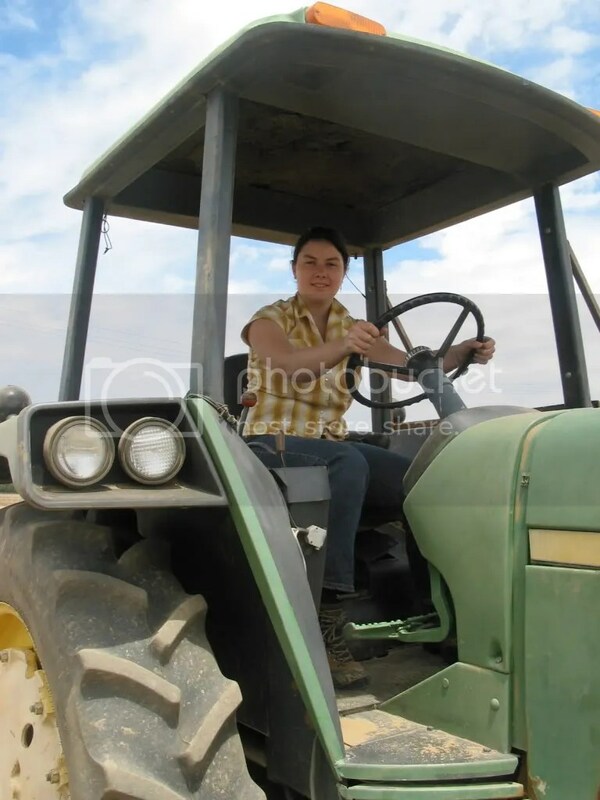 After high school I went to an Ag school where I learned how to drive a tractor and plow a field. Classes like this did nothing but reinforce my previous idea of what agriculture in the United States is. Working with KCCUA, Cross-Lines and Drumm Farm has thrown me for a loop, my definition of food and agriculture has been re-defined many times this semester. I’ve learned that food can be successfully grown within city limits and farms have many roles in the community. Urban agriculture can provide health and nutrition, combat poverty, and educate children. Unbeknownst to many people agriculture exists in our own backyard and it is thriving. 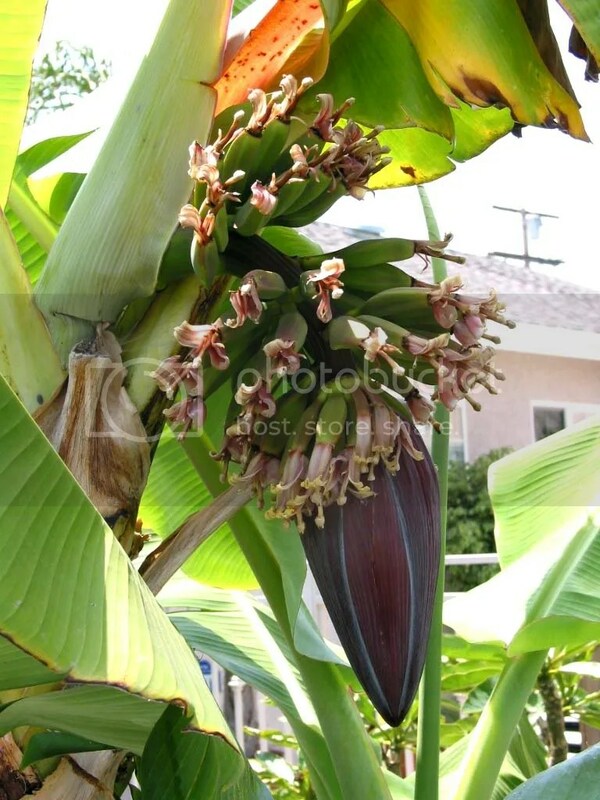 The banana tree in our front yard. Food has always played a huge role in my life, but KCCUA has helped give that food a face. It’s not just something from the grocery store anymore, food is grown by real people. I’ll shortly be leaving Kansas to move back to California and hope to embolden my friends and neighbors to support local produce and grow their own. My parents have already begun to grow tomatoes, herbs, nopales (prickly pear cactus), lemons, strawberries, even bananas. I can’t wait to try it all.